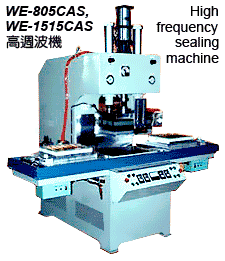 The high efficiency machine for simultaneous welding and cutting process for toothbrush packing of blister/card. These machine fit for PVC, EVA, PU, ​​non-woven fabric or synthetic leather. These material can weld by high frequency and cut at the same time. It can increase the effectively and the exterior of products will be more beautiful. trademarks, footwear, watch band, belt, toothbrush, packing bag, camera case, CD case, wallet ...etc.